A report in today's New York Times online indicates that the Food and Drug Administration (FDA) is about to take action on caffeinated alcoholic beverages, such as Four Loko. It has been over a year since the FDA began collecting data from the companies that market these beverages to determine whether the addition of caffeine to alcohol-containing beverages is generally recognized as safe. The Connecticut Attorney General Richard Blumenthal was quoted in the New York Times article as saying “To be very blunt, there’s just no excuse for the delay in applying standards that clearly should bar this kind of witch’s brew”. A statement posted on the TTB website in reference to this issue indicates that the TTB and the FDA both have jurisdication over different aspects of alcoholic beverages, and that the FDA enforces provisions of the Federal Food, Drug, and Cosmetic Act, and determines safety of additives used in the production of alcoholic beverages. 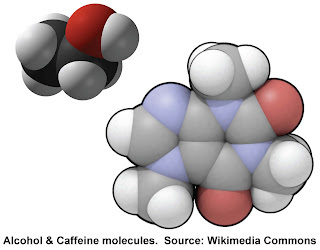 According to the TTB statement, the FDA did not raise objections to caffeine levels in beverages up to 200 parts per million (ppm), the limit set for cola products. Although Four Loko does not currently list the caffeine content on its product label, if it exceeds 139 mg (200 ppm in a 23.5 fluid ounce serving), a concentration at the low end of the range of caffeine concentrations present in 8 oz servings of generic brewed coffee, then this may exceed the limit that has been allowed by the FDA. CPDDBLOG welcomes CPDD member’s thoughts on this issue.